Authorities have identified the gunman who shot a security guard Wednesday at the headquarters of the Christian-based lobbying group Family Research Council. 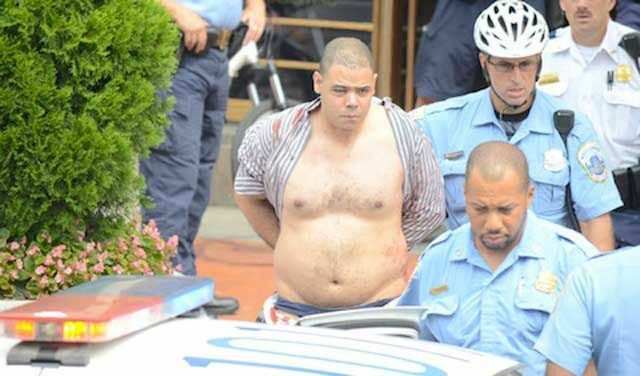 Floyd Corkins II, 28, of Herndon, Virginia, was taken into custody by Washington, D.C. police yesterday morning after opening fire in the lobby of the organization. He was characterized by witnesses as being a light-skinned African American male, approximately 6 feet tall and weighing an estimated 240 pounds. Police state that Corkins entered the headquarters of Family Research Council with a 9 mm Sig Sauer pistol that he had purchased recently from a gun shop in Virginia. He was also carrying a backpack that contained two loaded magazines of bullets with fifteen rounds in each. Additionally, reports state that four boxes of ammunition were found in his car. Corkins posed as an intern as an attempt to get past security, but the guard, Leo Johnson, questioned the man about his destination. Corkins then reportedly began yelling about the policies of the organization and shot the guard in the arm. While not confirmed by police at this point, it is believed that he shot Johnson in an effort to make way into the Family Research Council offices. Corkins was carrying items from a local Chick-fil-A restaurant. Johnson and others immediately tackled Corkins and disarmed him. He was held until police arrived. Photographs are now circulating of Corkins being led away by police wearing an unbuttoned shirt, now bloodied from being wrestled to the floor by the wounded security officer. Corkins has been working as a volunteer with the D.C. Center for the LGBT Community for the past six months, staffing the front desk on most Saturdays. The center is an advocacy and support organization for gay, lesbian, bisexual and transgendered men and women. Following yesterday’s shooting, the D.C. Center for the LGBT Community released a statement condemning the attack. “He always struck me as a kind, gentle and unassuming young man. I’m very surprised that he could be involved in something like this,” Mariner commented to reporters. Over 40 homosexual organizations have also signed a statement denouncing Corkins’ actions. As of press time, Corkins was charged with two federal offenses: transporting a firearm across state lines and assault with the intent to kill. Authorities state that the matter is being treated as an act of “domestic terrorism,” and motives are still being determined before classifying it as a hate crime. He faces a maximum of 40 years in prison. Both the D.C. Police Department and FBI are continuing to investigate the matter, and have been canvassing Corkins’ neighborhood in Herndon, Virginia.